Dining at all inclusive resorts: Raising the bar with exclusive venues, star chefs and exotic local dishes. The dine-in-the-dark experience at The Black Hole at Grand Oasis Sens in Cancun, Mexico, bears little resemblance to the lackluster buffets often associated with all-inclusive resorts. Guests are asked to dress in black. Upon arriving, they’re ushered into a completely dark room by a white-gloved maître d’ wearing a fluorescent white mask. They feast on a tasting menu offering a dozen or more small plates— ranging in style from traditional to molecular gastronomy—all served with wines. By design, the bite-size servings can be consumed without utensils. After each course, entertaining waiters ask diners to guess what they’ve eaten based on texture, flavor and scent. The Black Hole currently ranks #2 among the 705 Cancun restaurants listed on TripAdvisor. More surprising, perhaps, it is part of an all-inclusive resort. There is no upcharge for Grand Oasis Sens resort guests; outside patrons pay about USD 55 per person for this unique sensory experience. Increasingly, food is a key consideration driving choices made by travelers. “It’s a way for specific hotels, tour operators, cruise lines, and even cities to differentiate from one another,” says Douglas Quinby, a vice president with industry research firm Phocuswright. To stand out among stiff competition, all-inclusive brands are finding they need to creatively revamp dining venues, redesign menus and improve food quality to appeal to food enthusiasts. “With social media, guests are able to read and review hundreds of customer opinions about food and restaurants and see photos on Pinterest and Instagram,” said Ignazio Podda, executive chef of both the adults-only Hyatt Zilara and the family-friendly Hyatt Ziva Rose Hall, both in Montego Bay, Jamaica. “Also, the popularity of cooking shows has led to a more educated clientele,” he said. Like cruises, meals at all-inclusive resorts are paid for in advance and options for dining elsewhere tend to be limited, costly or non-existent. If the food turns out to be disappointing, a week’s worth of mediocre meals can tarnish the afterglow of a vacation as well as the reputation of a resort. Lumiere, an intimate French-fusion restaurant at Le Blanc Spa Resort in Cancun seats 46 people. With silvery-gray draped wall coverings and dramatic lighting, the room has a romantic, sophisticated feel. Guests can either opt for the seven-course tasting menu that emphasizes seasonal ingredients or order off an a la carte menu. Even at all-inclusives, travelers want to connect with the food and culture native to the place they are visiting rather than be limited to international menus. Hyatt all-inclusives in Jamaica showcase local dishes like curry chicken, and ackee and saltfish. There is even a jerk shack (called Jerkz) on the beach for tasting this Jamaican staple. The Caves Hotel & Resort in Jamaica, a boutique all-inclusive property situated on the edge of Negril’s limestone cliffs relies on fresh produce from Pantrepant, record producer/owner Chris Blackwell’s farm in Trelawny parish. Diners at The Caves also savor local dishes such as rock shrimp with sautéed callaloo and stuffed crab shells. At Secrets The Vine Cancun, guests are treated to dishes like cochinita pibil, a slow roasted pork dish of Mayan origin. As visionary Chef Dan Barber expounded upon in his book, The Third Plate, cooking is a cornerstone of sustainable agriculture and chefs have profound influence on the way people eat. Another Jamaican dish on Hyatt’s menu is Chef Podda’s fall-off-the-bones oxtail with rice and peas (red kidney beans). A “fifth quarter meat,” oxtail is an animal part that often goes unused. “Even guests who are reluctant to try it can’t get enough after they’ve tasted it,” he said. The recently opened Hyatt Ziva Cancun has its own microbrewery showcasing unique craft beers made by the head brewmaster, Juan Jose Garcia. Waste from beer production is used to fertilize the soil on the grounds. Podda has also introduced new fruit selections. “When we serve cocoa fruit, guests can’t believe they’re eating the fruit whose seed gives us chocolate,” he said. Some other local favorites: sweetsop, soursop, honey bananas, red bananas, June plums, star apples, star fruits and naseberry. Guests vacationing near water always crave fresh seafood so at Zoetry Agua Punta Cana in the Dominican Republic, grilled snapper with coconut sauce and rice is on the menu and at Secrets Royal Beach Punta Cana, Caribbean grilled grouper with saffron sauce. El Dorado Royal, a Spa Resort by Karisma in Riviera Maya boasts a 76,000-square-foot greenhouse that grows herbs and produce for the brand’s nearby properties. Guests lounging around the multiple pools at Secrets The Vine Cancun can nibble on freshly prepared sushi and catch-of-the-day ceviche on ice. At Casa Velas in Puerto Vallarta, Mexico, fresh fruit paletas (Latin American ice pops) are served poolside twice daily. At the Hyatt properties in Jamaica, seven food carts move around the grounds at different times of day serving granitas, tacos, hot dogs, peanuts, coconuts, fresh fruit and crepes. 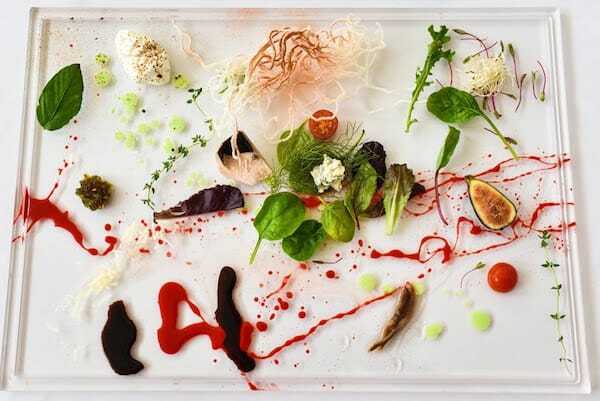 Chef Rafael Zafra, a protégé of famed El Bulli Chef Ferran Adria, first opened the molecular gastronomy restaurant Hacienda Benazuza at Grand Oasis Sens. Chef Daniele Muller, who trained at the Institut Paul Bocuse in Lyon-France and worked at Michelin star restaurants in Lyon and Paris, presides over the Italian-Swiss restaurant at Zoetry Villa Rolandi Isla Mujeres Cancun. At Grand Velas Riviera Maya, Chef Michael Mustiere is at the helm of the Parisian-style Piaf. He is one of seven chefs in Mexico and 300 in the world to attain the prestigious Master Chef of France title. Another restaurant at the same resort, Cocina de Autor, is the first in the world to be awarded an AAA Five-Diamond Award as part of an all-inclusive. At Velas Vallarta in Puerto Vallarta, Mexican TV personality Chef Yolanda Yanar stages live cooking shows each week along with mixology demos featuring margaritas, coladas, and tequila-based drinks. Because guests appreciate novelty, there are always new surprises. You might not think of finding Mexican food in Aruba but Divi Aruba All-Inclusive recently opened Pure Lime, the first full-service Mexican restaurant on the island. Wow – what fabulous photos and descriptions~! And eating in the dark…quite a unique experience. I found it pretty creative, too! I’m not sure I would enjoy the Black Hole dining experience, but I am impressed with its creativity and with all the other dining options showing up at all-inclusives. I particularly like showcasing local dishes. One of the joys of travelling is experiencing the food and it is easy to miss out on that when staying at an all-inclusive. I love all-inclusives but I always try to “get off the reservation” too! Wow, that Garden Canvas at Alquimia at Playacar Palace looks incredible – as artistic as it was delicious I’m sure. I’ll be in Cancun this month so will definiaely check out the Black Hole dining experience. I haven’t been to the Black Hole so I’m anxious to hear about your experience! Fabulous post – I hope this is or was a freelance piece in some publication as it is obvious the work that went into the research and writing! Terrific write up Irene and I couldn’t agree more. I’d love to experience dining at The Black Hole sounds intriguing. Hotels and resorts have all been upping their culinary game which is great news for travelers. We had the chance to eat at Le Chique in Puerto Morales which is in the Azul Sensatori Resort which touts gourmet inclusive. It also was a unique dining experience. These changes aren’t surprising. To get food-conscious travelers to commit to 3 meals a day during their vacation, hoteliers need to offer upgraded food options! The Black Hole sounds amazing. I did something similar in Montreal, Quebec but they certainly didn’t ask patrons to wear black. The Black Hole sounds much fancier! And to be part of an all-inclusive resort? Wpw. I agree, It sounds like a one-of-a-kind culinary experience! Everything looks so yummy. But you had me at The Black Hole at Grand Oasis Sens in Cancun, Mexico. It’s now on my list. It sure tickles the imagination, doesn’t it? Can we just visit all of them? I love it when all-inclusives raise the bar like this. Gone are the days when you’d avoid them because the quality was only average. Great stuff, Irene.